Assassin Katla breaks her own rules when confronted with an unusual witness...Blessed with an almost non-existent conscience, Katla Sieltjes, expert in disguising homicide, views assassination as an intricate and rewarding occupation. Hidden behind her male alter ego Loki, Katla receives anonymous assignments, negotiates the terms with clients through electronic means, all to protect her identity. Her solitary existence satisfies her until she meets a blind musician whose failure to notice a 'closed' sign causes him to wander in on Katla's crime scene. And Katla breaks one of her most important rules - never leave a living witness.Reprobate is the first novel in the Amsterdam Assassin Series. With authentic details and fast-paced action, featuring an uncompromising heroine and a supporting cast of unusual characters, Reprobate gives a rare glimpse in the local Dutch culture, information on the famous Dutch capital, the narcotics trade, computer hacking, motorcycle gangs, mehndi bridal tattoos, martial arts, and the brutal effectiveness of disciplined violence.This e-book now features a glossary.The Amsterdam Assassin Series by Martyn V. HalmThe Amsterdam Assassin Series revolves around freelance assassin and corporate troubleshooter Katla Sieltjes. 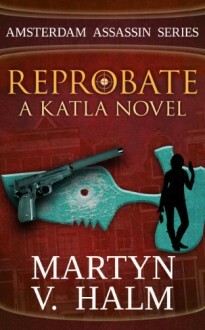 Under the name Loki Enterprises, Katla specialises in disguising homicide and providing permanent solutions for both individuals and corporations.The NovelsThe first novel in the Amsterdam Assassin Series, Reprobate, marks the first time Katla breaks one of her own rules, and how this affects both her personal and business life. The second novel, Peccadillo (available on Amazon), shows what happens when you attempt a hostile takeover of an assassin's legitimate business cover. The third novel, Rogue, is planned for release in 2013. While the novels can be read out of order, reading them in chronological order might be more enjoyable.The KillFilesBetween the publications of the novels, the Amsterdam Assassin Series also features stand-alone short stories, the Katla KillFiles. The Katla KillFiles chronologically precede the novels in the Amsterdam Assassin Series. Each KillFile features Katla executing one of her contracts before the events in Reprobate, and, while not mandatory reading, each KillFile provides insight both in Katla's work methods and skill, and additional background information in her character and personal history. The KillFiles can be read out of sequence, as the contracts are random samples from her past. Each KillFile also contains a teaser from the novels in the Amsterdam Assassin Series.